This spring our clients cute boys were featured on the cover of Phoenix Home & Garden - Outdoor Living at it's Best. Inside the spread were many pictures of their beautiful home we designed... here are few pictures from our private collection! The Refined Group's first half of the year has been off to a busy but wonderful start. Catch up on our recent publication by visiting our PRESS page HERE. The Adirondack chairs from Design Within Reach are a great modern play on a classic comfortable outdoor chair. They come in a rocking chair style which is great for summer nights on the porch. The Beach People is an amazing company from Australia. They are making waves with their circular beach blanket. We particularly love the Tulum design. It wouldn't be summer without a refreshing drink, check out the outdoor glass from Crate & Barrel, they look real and are great for around the pool. Vintage playing cards are Hermes, and The Vix Ibiza Bag is from Goop. As we transition into winter chill, it is great to cuddle up to fur. With technology improving in textiles, there are great faux furs for interiors and of course there is always real fur options. Here are some interiors we recently used furs in. This comfy sofa makes a luxurious living room glam. We used both faux fur by Nobilis and real fur pillows to accent. This entry makes a statement with a custom made shearling bench. You can find similar sheepskin at Celtic & Co. It sets a modern tone in this mountain retreat. In this historically accurate hacienda bedroom, our client purchased great Mongolian fur throws and cowhide throws to make for a natural surrounding, similar hides can be found at Cowhide International. Using warm neutrals to complement the outside mountain surrounding these custom made chairs use Kyle Bunting cowhide to make a subtle statement of luxury. In this modern bedroom we used faux fur to warm up the interiors. The fur back pillows are from Restoration Hardware and the throw is custom made using Overland skins. We also love Ralph Lauren’s Post and Lintel Chair and Ottoman in white shearling. Really beautifully simple. Lastly, these sheepskins from Costco are a great buy and make any chair or cushion look swanky. Recently featured in the inaugural issue in Phoenix- Sophisticated Living, this new house we had the pleasure of working on is a subtle story of muted grey’s. From the hand finished front door and shutter accents on the house to many other details throughout. It is a study in restrained elegance for a lovely couple and their children. The muted grey’s in the Carrera marble along with grey linen shades create a soothing retreat. The grey linen theme is carried into the bedroom using various tones of grey throughout. The homeowner chose the beautiful grey wallpaper from her favorite home store Found in mesa for the dining room. The custom pewter mirror is from On the veranda. The kitchen features Carrera marble with highlights of grey and the subtle sage cabinets have a grey wash over them. The lighting is custom made from Hinkley’s. The laundry room carries the theme from the kitchen and features a farmhouse sink. The powder room is painted a pale grey and features an antique Carrera basin from Relics. The architect and is the talented Jim Blochberger and the builder Brett Brimley is known for his fine craftsmanship. While many of these finishes are old world in inspiration, the interior exudes sophistication, simplicity and timelessness. Get the latest copy of Sophisticated Living to view the full spread. As we begin 2015 we are very excited to be included in Luxe Magazine's 2015 Gold List for the second straight year. Beginning the new year is a time to reflect on all of our past work and some of the highlights. Being an enthusiastic cook, I have enjoyed the art of kitchen design over the last decade. Here are some of our favorite things to include in kitchens and some features from kitchens we have designed with our clients. Special ingredient: Custom stainless hood with a high capacity plate and food warmer. Special ingredient: For a truly European kitchen the La Cornu CournuFe Range combines the gas vaulted oven with the appeal of a five burner cooktop. Special ingredient: New from Le Creuset matte white French ironware, perfect for braising or searing meats. The white is a fresh clean look. Special ingredient: Keep your kitchen feng shui and your knives sharp with a pull out knife holder from William Sonoma or custom made by a cabinet maker. Special ingredient: William Sonoma's Thomas Keller's collection of All-Clad is great for it's universal lid and healthy cooking. The lid is adjustable for the entire series, saving storage. Special ingredient: Custom floating shelving for wine bar storage creates a clean look and allows your guests to serve themselves. Hope these ideas enhance your culinary adventures! This is a table setting for Kings and Queens literally! Baccarat has an amazing exhibit at the Petit Palais celebrating its 250 year heritage through January 4, 2015. It is a joy to see and if you are wanting a special gift there are many things on sale in the USA through their website. Here are some champagne flute sin the oldest Baccarat pattern. 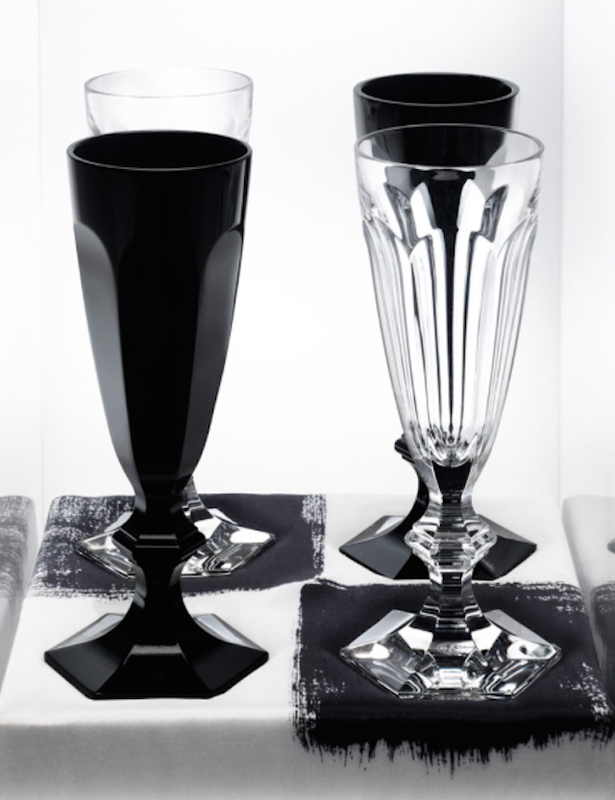 Harcout, which was created in 1841, which comes in black glass giving it a modern twist. Thanks to the generous women in my office I am loving- My Paris Kitchen . The mustard chicken on the cover is to die for and easy to follow. It is great gift and the author, David Lebovitz, has a blog worth perusing before a trip to France. Another great girlfriend and I had a memorable meal at Spring Restaurant in Paris. It was an amazing dinner and we both wanted this wine carafe, which is great for both wine and water. If you want a slice of Paris for your walls, please see Sue Dumke’s fantastic larger than life Barbie photos. It is an Audrey Hepburn at the Paris Opera. This photograph was being auctioned for Unicef in Paris and is quite large and dramatic. To see more of her work go to or contact her for more on the Barbie series. I often use them in our interior projects and customize the size. PDG wishes you, your family and friends a blessed and Happy Thanksgiving! Here is a little taste of a clients vacation home that was recently featured on Luxe Magazine's blog, Luxe Worthy. Our goal was to take the homeowner's passion and personality and turn it into a space filled with light and relaxation. To learn more about the process go here. For more images of the property click here. We cannot thank Luxe enough for their continued support. Pillows with Embroidered Coat of Arms- political dynasty/ banking/ royal house/ Mugello region/Medici Bank/ Europe/ Florence/ Here is a link to a book for more information. For the real thing visit Highboy. Intaglios- framed reproduction ones go here.